Happy Boo Day. I am so liking the window frame thinlits. Super cute ideas will be coming your way using this great die. We also have an adorable stamp set to go with it that cover four seasons. Super awesome for creating all kinds of cards and scrapbook layouts. Get it while supplies last at the purple underlined links below. 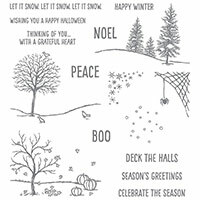 Celebrate the season, whether it's autumn, winter, Halloween, or Christmas. The Happy Scenes set covers them all. 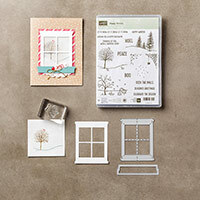 Hearth & Home Thinlits Dies #139666 $20. Add all sorts of interest to your projects with window frames and window boxes you cut in record time with Thinlits dies and the Big Shot.